THE FIRST EPISODE OF THE RADIO SHOW HAS HAPPENED AND IS ARCHIVED HERE. The nice thing about social media? It is an infinite source of stupid. It really is. For example, there is a guy who works for Tor Books named Moshe Feder. He seems to have no other job but to troll Sad Puppies on Facebook and blogs. According to the grapevine, he's a special snowflake who must only deal with A-listers like Brandon Sanderson ... who, apparently, doesn't actually need an editor. Take from that what you will. I watched on of his endless tirades on Facebook spiral out of control into a hate fest of epic proportions, where friends of mine were attacked, I was attacked, I went a few rounds with David Gerrold -- who really does scream Vox Day a lot -- and who smashed down on my Bruce Banner button. Then they went after another friend of mine, Sherry Antonetti, she of The Book of Helen. I have very, very, very few friends. I love my friends. Touch my friends, you lose your fingers. Yeah. Irene Gallo is a creative director at Tor. I wonder if that translates as political officer. 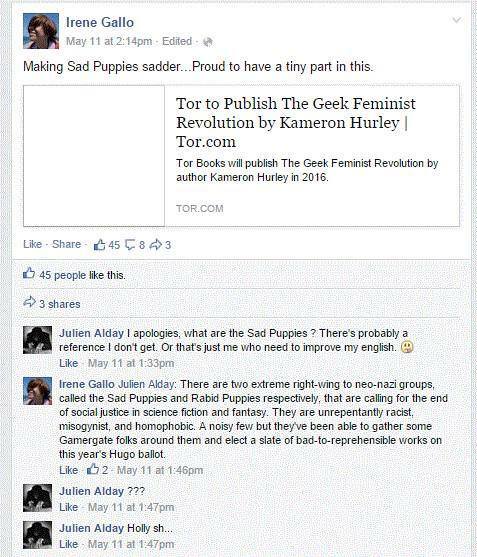 Also: Does she realize that these "bad to reprehensible works" INCLUDE BOOKS BY TOR ITSELF? Seriously, does she not want to work anymore? Did she not read that part of the talking points? Teh stupid! It burns, precious! Her response to critique? Cat photos. Apropos of the Irene Gallo ridiculousness. It's been said that a letter from a consumer is worth 100 angry rants on the internet. The exercise of good judgment is still expected from employees at all times. • Could this conduct be viewed as dishonest, unethical or unlawful? • Could this conduct hurt other people – e.g., other employees or customers? • Would I be embarrassed to see this conduct reported in the newspaper? Anyway, I'm not angry now. In fact, that particular fracas was days ago. Probably days by the time this is actually posted. But puppy food is a dish best served cold. [Teresa "Long Knives" Nielsen Hayden lays back in her office chair, tapping away at a laptop, explaining why the Evil League of Evil was just soooo evil, and the Friends of Sweetness and Light were just too good and pure to be considered "Puppy Kickers."] How do you spell insidious? [The desk next to hers is her husband, Patrick "Hearst" Nielsen Hayden, throwing darts at a board with Larry Correia's photo on it. It is, of course, a palatial space, and he misses most of the time. One dart heads right between Correia's eyes, then stops in mid-air, and then falls, seemingly scared of a photo of the International Lord of Hate.] Blast it. It's spelled with three "i"s.
[TNH nods] Got it. Must be consistent. It's not like there's one word that says "racist bigoted misogynistic homophobe." [PNH] You mean it isn't "Vox"? 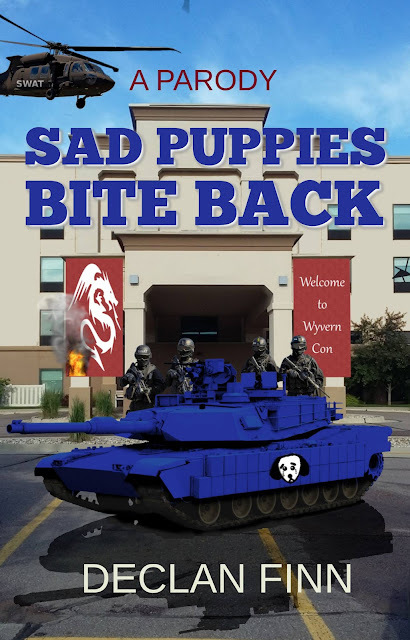 [PNH] So, how goes the war on Puppies? [TNH] I don't know. I'd have to ask. Igor! Igor! [Moshe Feder limps in. He is cloaked in a thick, black, hooded cloak, so he can avoid sparkling in the daylight.] Yeth, mathster? [TNH] Are you done spamming Brad's Facebook pages and blog posts? [MF nods like, well, an eager puppy] Yeth, mathster! Yeth! I've even gone after them for calling us CHORFs! [TNH] Yes! How dare the puppies make fun of us, even a little. [PNH] Yes. It's not like we don't have a sense of humor, but still. [TNH] No dear, don't you remember? We had ours surgically removed some time ago. [PNH] Oh yes, quite right dear. So sorry. [MF nods eagerly] I have retaliated by calling them talentless hacks. My mindless followers call them hillbillies, even the ones from New York City! [TNH smiles] Good. And if you're well-behaved, we'll make certain that you do nothing but edit the big name authors like Sanderson -- the ones who do their own editing. Fail, and you'll only get to play with the mid-listers. [MF flinches, like a vampire flashed a crucifix] No! Not that! I'll be good, mathster. [PNH glowers] And if you really screw up, we'll hand you over to Vox Day, just like we're doing with Irene Gallo. [TNH nods] Yes, how DARE she say that our books are bad! [They say as one] DON'T SCREW IT UP! [MF] I have a minion who will state that women were only allowed on their ballot because the Puppies approved it! [The Haydens exchange a look. TNH asks] What does that even mean? [MF] Whatever we say, mathster. No one questions uth. [TNH] Has anyone mentioned how we've just given a white male like Scalzi a $3.4 million advance on books that may not even break $2 million? [MF shakes his head vehemently] Of courth not! He'th one of uth! No one talks of it! [TNH] Good. I would hate it if it looks like we're paying him off for his work on kicking the puppies. [MF] And we have David Gerrold chime in every once in a while and scream of Vox Day! [TNH frowns] One day, we have to get him to speak in whole sentences again. Speaking of, any word from Vox? [Pat Hayden checks his emails] Awww, he's making fun of us. I just got a press release sent out from his composite steel throne on the Geyser of Faithful Tears. [TNH pats him on the head] Don't worry. Moshe's a better fan than all of those big bad bullies put together, aren't they? [MF smiles] Torgersen has given us a great idea! We can twitter bomb JJ Abrams for the racist, sexist, cisnormative Hell-hole that will be Star Wars episode VII. [PH] Brilliant! Wait, how many ideas do you steal from the puppies? [TNH, to Moshe] Igor, make sure that nothing can be traced back to us, will you? We'd rather not the great and powerful owner get wind of it. He may get the wrong idea. [MF] But I thought we can post what whatever we want, precious. [TNH] Well, *we* can't say anything, but you can. Because you're special canon fodder. By the way, how goes the efforts by our supporters to SWAT the Puppies? Sarah never laid a hand on that swat team what came to her house. First off, she just moved, so the old address is mostly empty at night. But I suspect her two boys were keeping an eye on the place, so I'd wager the entire team had been put to good use as medical experiment subjects. The poor bastards. STEM graduates vs literary elitist CHORFs, hardly seems like a fair match. The Sad Puppies and the CHORF I mean. I'm sure swat put up a good fight before the anesthetics kicked in. Heh. I guess I'll need to have a rewrite for the "first" SWAT attempt, with the one that appeared in SPBB 1 as the "second" attempt. *giggles hysterically* They never let poor JCW finish the options. Oh oh, since y'know, it's only fair... here's screenshots of when Yama demanded I find something wrong with his work some years ago. He said to bring it on, so I did. For the record, is Yama by any chance the stalker of Vox Day? Or is this some other nutter online? He's the same nut that used to come in the kratskeller; You know, in Baen's Bar. I think it was born in "spacebabies". Yes. That's the guy who stalked and harassed Vox Day. Yama has also been stalking and harassing me for almost 7 years now, and has a known history of being a crazy stalker. In fact, he keeps getting banned and IP banned at Brad Torgersen's blog, and has been using proxies to evade those bans. There's examples in the comments of Brad's latest post.